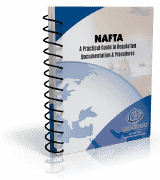 This publication is intended as a teaching tool to help businesses understand the NAFTA and to develop proactical business processes for participating in the free trade agreement. The book was designed predominantly with U.S. exporters and importers in mind. as such it draws, not just from the NAFTA treaty, but also references the U.S. regulations and interpretations issued by U.S. regulators. Mexican and Canadian importers and exporters will also find this textbook useful. Whenever possible the author has included references to Canadian and Mexican resources. Global Training Center’s “NAFTA: A Practical Guide to Regulation Documentation and Procedures” was written by John D. Goodrich. Mr. Goodrich is an International Trade Consultant and Licensed Customhouse Broker with more than twenty-five years of experience in international trade. He is currently the principal in the consulting firm of JD Goodrich & Associates where his varied industry experience results in practical, actionable advice for his clients. An active member in the Twin Cities round table of the Council of Supply Chain Management Professionals (CSCMP), he takes a strategic view of the roles of international compliance and logistics in the greater supply chain. Mr. Goodrich is an engaging trainer and speaker on a variety of international logistics and compliance subjects as well as the author and co-author to several other trade books, which are offered here at GTC.